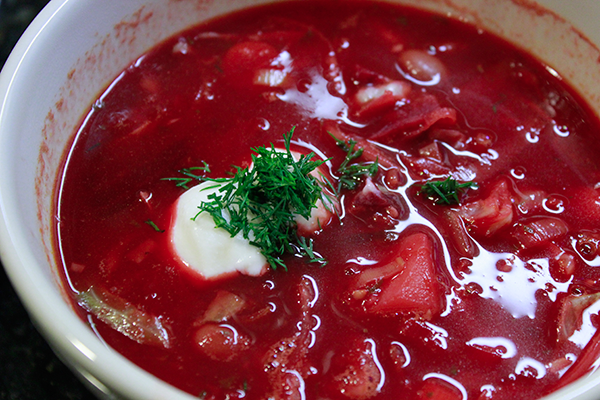 The quintessential eastern European soup: borscht. Of all Dad's recipes, this one is proving to have the greatest longevity - we all make it. My own enhanced version here has been tested across nations to much acclaim (Peter). Shop-bought (Trader Joe's) beef stock (2 cartons). Four large beef bullion cubes dissolved in water. 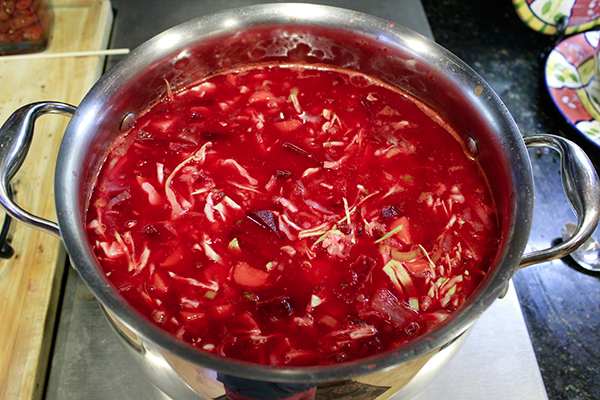 A world-class borscht often starts with a world-class pork stock. Two or three smoked pork (ham) hocks boiled gently in half a pot of water for 90 minutes or so. 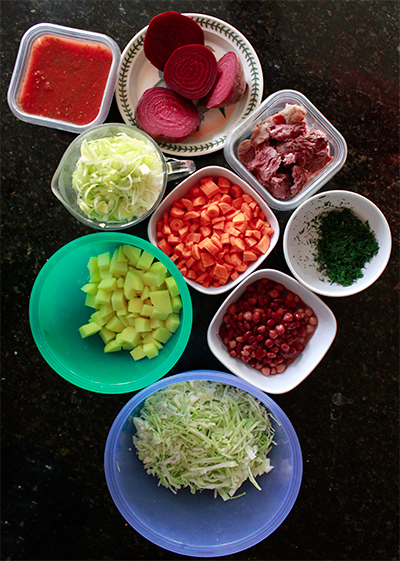 Remove, strain, place stock in fridge overnight, scoop off fat before using. 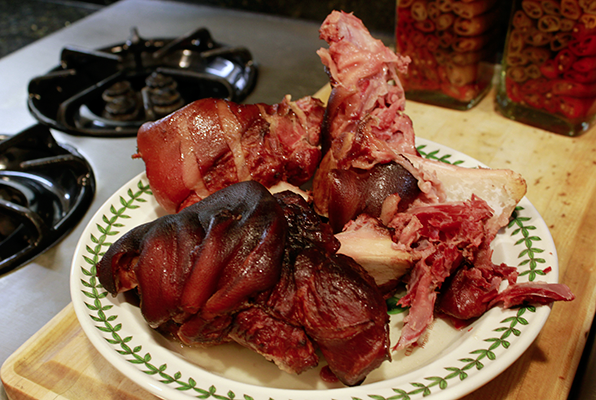 Cut up meat from pork hocks and add to soup at the end. 1. 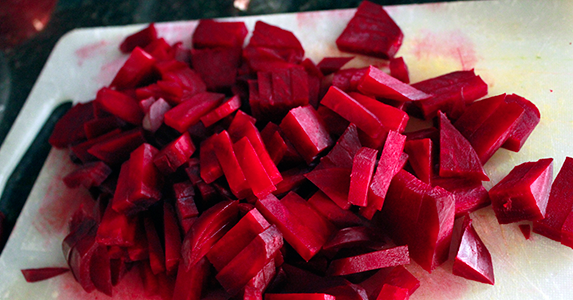 Cut off beet tops and bottoms, scrub very well to remove dirt (don't peel), trim crusty brown bits from around tops, add to stock and boil for 15 mins or so. Remove, let cool a bit. Leave stock boiling gently. 8. Gentle boil until potatoes are nearly soft. 9. Shred cabbage as fine as your knife allows, add. Add bean medley. 10. Test for cooked-ness, add plenty of salt and pepper to taste. If needed, add a table spoon of sugar (+/-) to balance any tomato and lemon sourness; or, add lemon. 11. Serve with dill, sour cream, crusty bread, maybe garlic toast, and a story about how your Dad's borscht was pretty good, but not as good as yours. 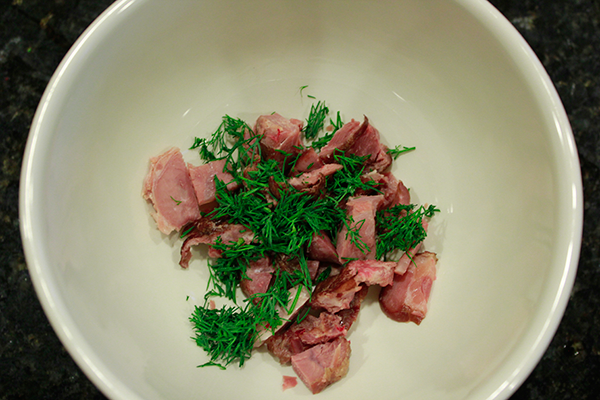 Place the cut-up pork from your stock meat and add to bowl, with dill. My borscht is more red than purple - on account of the tomatoes.